Plus, Hong Kong website shares a ton of English details. Freedom Wars will launch for PS Vita in Japan this summer, Sony Computer Entertainment Japan announced. A limited time demo version is also being planned. The game—a join development between SCE Japan Studio, God Eater 2 developer Shift, and Street Fighter IV developer Dimps—is set in the city state of Panopticon, where you’re sentenced to a million years in prison the day you’re born, and to attain freedom, prisoners must “recapture” civilians from the war zone. Find a ton of English details from the game’s newly opened Hong Kong website below. This represents the people of Panopticon. Experiments of men throughout history have led to the violence between nations which ultimately result in their destruction. This eventually led to the disintegration of countries and people show their sorrow of defeat. However, this does not mark the end of men as they are determined to find answers of their destiny. The city state of Panopticon is the symbol of men’s reconstruction of the pyramid, an example of how people’s government should evolve through the challenge of time. The city state of Panopticon is an artificial nation which brings great efficiency and comfort to its people, providing a full system of security as well. This system forms the root of the society, in which all people of Panopticon are a part of and obligated to show their support. Under the leadership of the central headquarter, all men of Panopticon shall make contribution to their home state. In return, the state shall promise a fair distribution of rights and resources to its people. For the first time in human history, people have finally reached an ideal society of true equality and mark the beginning of prosperity. To all people of Panopticon: Before us there is no nation, and no nation behind us. Let us proceed to our hopes and dreams under the noble ideas of Panopticon. In near future, the world will become an unlivable land for all living creatures. For this reason, people have built cities called “Panopticon” at various locations of the world for survival. However due to a severer lack of resources and an undesirable living environment, these cities start to conflict with each other. In order to effectively rule the people of Panopticon, most people are put into sentence. Those who are placed under sentence are called “Criminals” and they are forced into strict labor. This kind of labor is known as “volunteer” for war. For the sake of their freedom, these “Criminals” have to continue to “recapture” civilians from the war zone. The “Criminal” – Person of felony – The Criminals are those who belong to the city of Panopticon imprisoned for one million years upon birth. They are forced into “volunteer” in order to reduce their sentence and regain their freedom. Their sentence is indicated with the philosophy that people are wasting resources upon their birth, so their existence is a form of crime. Therefore, under the PT law those who are born in Panopticon are automatically labeled as “Criminal” and sentenced for one million years in prison. The lives of criminals are put under complete surveillance while having limited and unreasonable rights. However, they are granted with more guarantees for going into battles. This then becomes the only way to reduce jail time and the reason for them to “continue” to fight. In the long run, the inexperienced Criminals eventually develop into veterans. The player will become one of the Criminals and join into war for volunteering for freedom. The player can choose the gender and the appearance of their character. Accessories – Surveillance ≒“Accessory” of the Crime – They are the androids that act as surveillance and partner for players as being Criminals. This android is given by Panopticon mainly for surveillance purposes, at the same time serving as a “Portable Unit” and a “Carrying Weapon”. Every act of the player is under surveillance in Panopticon, and the player has to obey the Panopticon’s orders conveyed by the android by all means. During the volunteer battles, the android serves as a trustworthy weapon and partner, as well as a communication window for contribution after the war is over. Every act of the player is under surveillance in Panopticon, and the player has to obey the Panopticon’s orders conveyed by the android by all means. During the volunteer battles, the android serves as a trustworthy weapon and partner, as well as a communication window for contribution after the war is over. The android can be customized in the game. Features including face, hair style, costume, AI, words of expression and voice can all be adjusted. This data can also be exchanged with other users. Uwe “Sakamoto” Cabrera (CV: Nakata Jouji) – The valiant veteran – The brave warrior who constantly fights to contribute to the society of PT. He has guided many Criminals and the protagonist is one of them, helping them to realize their freedom. Mattias “Leo” Bruno (CV: Akira Ishida) – The friendly shaz – He is a new criminal having the same perspective as the protagonist, being a friend and a rival at the same time. Since he is in the same situation as the protagonist, he looks out for the protagonist and counsel with him/her often. Although he does have a bad past record, he is a direct and trustworthy guy who won’t say no to requests. Aries M (CV: Yumi Hara) – A mysterious girl guiding the protagonist – The mysterious girl who appears before the protagonist at times. It is like a dream world whenever she appears. So what is her purpose? From where and how does she appear? Natalia “9” Woo (CV: Yuu Asakawa) – The fight of “Law and Order of Panopticon” – The executor for the PT law and order. The captain of the 35th Social Security Group of the Investigation Committee. She is a firm believer in the ideals of the PT top supreme and act according to the law by all means. Although she appears to be a cold female officer, deep inside she is an affectionate emotion hoping to protect those dear around her. Volunteer takes place at various locations. The use of high speed thorn is restricted at desert containing few buildings and obstacles, so this leads to up front battles. The living weapon of “Artificial Abductor” is the result of advanced technology and it can serve multiple purposes. Some of such purposes include acting as a “Transportation Vehicle” for civilians. It is capable of riding up to 3 people. There are multiple cages for the Criminals to break in order to recapture the civilians. Depending on the type of “volunteer” and Abductors, more than 2 civilians can be transported at the same time. It is the only private space given to the Criminals. It will be under complete surveillance with no exceptions. Since the Criminal is under constant surveillance, there is no privacy. The Accessory will be monitoring the Criminal at all times. Criminals with a higher level of information rights (code) are given a better room. The city buildings are constructed with designs for effective management of resources in the time of deprivation. It is a form of city ecology and a system for a complete control of people. People scattered throughout the earth start to gather together in building the PT structures only to result in later conflicts with each other. This place contains more space in order to connect individual rooms together in Panopticon. The stairs connect levels of the building containing the separate rooms. The rooms are also designed for easy surveillance. The inner walls of Panopticon are specially made with a large display broadcasting propaganda from the central PT. Surveillance can see through the walls and carry out a strict control. The street is wide enough to allow large Abductors to pass through. It is also a resting spot for Criminals who are permitted to go outside but they are still under complete watch. The city buildings which are constructed with designs for effective management of resources in the time of deprivation. The Panopticon laws have become absolute in order to implement a complete resource control. This law system is formed in the history of men and the number laws are countless. This system also forms the root of the Panopticon society. People around the world have created various Panopticon states and imprisoned a large number of Criminals only for use of conflicts in war. The Criminals will continue to carry out their volunteer labor in order to recapture their freedom. In modern days, there are currently more than 6 million people in jail; but there are more than 1 hundred million people now serving as “Criminal” in this world. There are countless surveillance cameras in this world. The men wearing goggles signifying having some kind of authority since they are feared by people on the streets. These large living weapons are called “Abductors” by the Panopticon people. Various types of Abductors are developed as weapons. Thorns are equipped on the left arms of the Criminals. The Criminals have the ability to make thorns stretch out and draw back and move themselves to various places. There are various types of thorns and their functions will change with development and enhancement. Civilians – They are the technicians who are maintaining and developing the cities of Panopticon. Panopticon cities start to conflict with each other, capturing civilians from each other, due to having advanced technologies. The Criminals join the volunteer labor in order to rescue the civilians. Accessory – Accessory is the achievement of high technology of Panopticon, so it also becomes a target for Abductors to capture. The Criminals have to rescue them immediately if they are captured during volunteer missions. Player – The defeated Criminals will be captured by the Abductors. This will mean the fail of mission so players will need to cooperate with each other in order to clear the volunteer event. The goal of the Abductors is to capture civilians. How will they capture them? How will the Criminals go against these Abductors? Weapons are sorted by the range of distance, in which further divided into various small and large swords, rifle and gatling, ect.. The new born baby is shown with “1 million” on the forehead. This number shows that the baby is under the control of Panopticon and the years in sentence. The Abductors can be destroyed by using weapons for close range. The Criminals can get a close on to the Abductors by using the thorns and destroy them by using special attacks. The destructive power of the Abductors can be tremendous and their goal is to capture civilians. The player can be killed in a single blow. The genre of “Freedom War” is “recapture” multi-play action. There can be a connection of up to 8 players using the Ad-Hoc or Infrastructure mode. The player can enjoy cross fights against large “Abductors” with multiple users. The focus of gameplay is the “recapture” goal of the missions. In other words, this is a game with the motive of “defeat the enemies to rescue the civilians and help each other out at the same time”. The player can enjoy the sensation of “cooperating with fellow comrades in cutting large enemies into pieces” too! Feel the adrenaline as the volunteer mission starts. What kind of power does the enemies have this time? For freedom, life and death of volunteer awaits. The mission starts with 4 Criminals along with each of their Accessories, making it a total member of 8. The Criminals head into the war zone as volunteer begins. This time the mission is on the city streets. The volunteer missions will take place at various locations. The Criminals can fly with their thorns equipped on the left arms, even when having large heavy gatling along with them. The thorn has the ability for shooting attacks and for high speed transportation. Various attacks will become available by making a good use of it. Get a grasp on the geography of the battle field by looking at the map display. It is important information for accomplishing the volunteer mission. The bullets of rifle and gatling are somehow blocked by a kind of energy. This Abductor is equipped with a gear that blocks attacks from long distance. Encounter the Abductors in hiding by proceeding into the battle field. Other Criminals on stand by hidden at the top of rough abolished buildings have confirmed the locations of the Abductors. Another Abductor soon appears behind the target. For this mission, the Criminals must battle 2 Abductors to recapture the civilians. It is assumed that battling multiple Abductors during the volunteers ahead is inevitable. The Abductors have the power to take the lives of the Criminals in a single blow. Pay close attention to the attacks from the Abductors! Close in the distance with the Abductors by using the thorn and attack them with a single blow. By utilizing the ability of the thorn, high speed in closing up the distance with height difference is possible. A close up weapon is more effective in attacking this Abductor. Attack it using various weapons. It is “death” for those who are careless. Distract the Abductors by attacking them with the thorns. Movements from the Abductors can be blocked by using multiple thorn attacks from multiple Criminals at the same time. An upper attack of close up range is also possible by using the flying ability of the thorn. Distract the Abductors, making strong attacks to damage their parts. By focusing on separate parts, they can be brought down for a chance of a critical blow. In order to destory Abductor’s hard outer shields, the Criminals have to use weapons with cutting abilities in order to cut the parts off. While the Abductors are temporarily brought down, it is the chance to rescue the civilians from the cage and run for an escape. However, once the Abductors are back in control it will start to attack again in order to capture the civilians back. The Criminals can successfully complete the volunteer mission only by carrying the civilians in their arms and make for a desperate escape. Besides the “Criminal” (Criminal = Player) and Surveillance ≒ “Accessory” of the Crime who are now open for public, characters including the valiant vetern, Uwe “Sakamoto” Cabrera and the mysterious girl Aries M who guides the protagonist are also introduced. “People are sentenced for a million years for their sins of living.” While the protagonist (player) fights in the continuous “volunteer” to seek freedom, he/she will encounter trustworthy comrades such as Uwe, and meets Aries M the character who appears at times to give hints. The story of “Freedom Wars” is about to begin with surveillance control, friends, happiness from the jail metropolis of Panopticon, and last but not least the sentence of 1 million years from the player character. Be prepared to seek freedom by encountering various characters, fight and overcome obstacles. 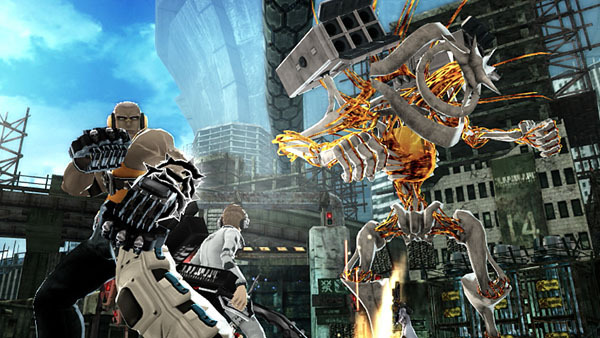 One of the key features of “Freedom Wars” is the use of “thorns”. Thorns are equipped on the Criminals as special weapons given by Panopticon. Each Criminal is equipped with a thorn and 2 weapons during their volunteer mission. When confronting giant living weapons of Abductors, bring them down by combining the force of thorn attacks from multiple Criminals. The thorn attacks can also be used to block the movements of the Abductors.